Ameiurus nebulosus, the brown bullhead, is a species of catfish native to North America and introduced to a number of other countries around the world as a game fish. It is a hardy species that can tolerate a wide range of environmental conditions, including water pollution, allowing it to successfully establish outside of its native range. Some concern has been raised over its invasive potential, but there is a lack of information on its effects. McDowall (1990) describes the brown bullhead as a \"stout fish with a thick body and ventrally flattened head. The back is moderately arched and there is a distinct hump behind the head. Four pairs of barbels are present around the mouth, with a single long one at each corner of the mouth, a pair in front of the eyes on the snout, and two pairs beneath the chin. The skin is thick and leathery with a layer of mucuous. Scales are absent. Colouration is a dark brown to greenish olive on the back, with slightly paler sides. The underside of the head and lower jaw are a buttery yellow colour, which pales to a creamy white or pale grey on the belly\". Resistant to domestic and industrial pollution, therefore able to survive in heavily degraded waters. Reported to bury itself in mud to avoid adverse environmental conditions (FishBase, 2004). Brown bullhead are scavengers as well as predators, locating their prey in the substrate through the use of their sensory barbels (McDowall, 1990). A painful wound can be inflicted by the sharp spines in the fins of brown bullhead catfish if they are not handled carefully. Toxins released by the fish contribute to the pain of the wound (McDowall, 1990). Maturity attained at two to three years of age, when around 180-200mm long. Can live for up to eight years (McDowall, 2000). Popular in some areas as a gamefish. Reportedly a good eating fish, especially when smoked (FishBase, 2004). Found in sluggish, often weedy, streams and rivers. Also occurs in impoundments, lakes, lagoons and ponds. 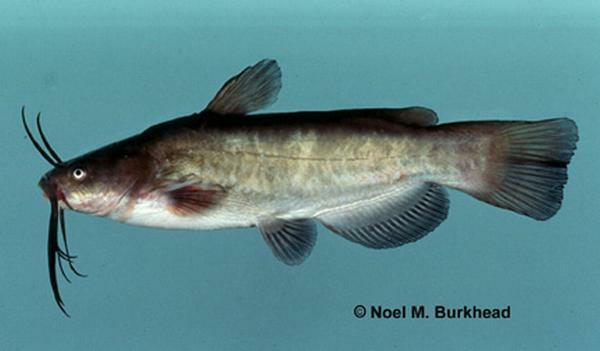 The brown bullhead can tolerate waters with high carbondioxide and low oxygen concentrations, as well as temperatures up to 31.6°C (FishBase, 2004). It can live out of water for long periods if kept moist (McDowall, 2000). Spawning occurs in a nest, a shallow depression in the substrate, built by one or both parents. Eggs are guarded, with the attendant fish moving them with its barbels and fanning them with its fins to encourage development. Hatching occurs in around a week, with the young dispersing in small shoals. (FishBase, 2004; McDowall, 2000). Feeds on a wide variety of items including snails, freshwater crayfish, fish eggs, worms, insects (adults and larvae), fish and algae (FishBase, 2004; McDowall, 2000).The main prey of adult brown bull head in Lake Taupo, New Zealand are freshwater crayfish (Barnes, 1996). Commercial fishermen may inadvertently transport brown bullhead in their nets, as they are able to survive for long periods out of water.Stocking may occur in locations where brown bullhead is valued as a sport fish. Principal source: McDowall, R. M., 2000. The Reed field guide to New Zealand freshwater fishes. Auckland, Reed. McDowall, R. M.1990. New Zealand Freshwater Fish a natural history and Guide. Heinmann and Reed MAF Publishing Group. Barnes, G.E., 1996. The biology and general ecology of the brown bull head catfish (Ameiurus nebulosus) in Lake Taupo. MSc Thesis, University of Waikato, Hamilton. Review: Dr. David Rowe, NIWA (National Institute of Water & Atmospheric Research). Hamilton New Zealand. Recommended citation: Global Invasive Species Database (2019) Species profile: Ameiurus nebulosus. Downloaded from http://www.iucngisd.org/gisd/species.php?sc=612 on 21-04-2019. Although there is some concern that brown bullheads may negatively affect trout fisheries (Dedual, 2002), freshwater crayfish (Barnes, 1996) and eels (Rowe and Graynoth, 2002) there does not appear to be any hard evidence of environmental impacts caused by this species. Dedual (2002) suggests that commercial harvesting of brown bullhead using fyke nets in Lake Taupo, New Zealand could be an option if they are found to impact upon trout. Informations on Ameiurus nebulosus has been recorded for the following locations. Click on the name for additional informations. Dedual, M. 2002. Vertical distribution and movements of brown bullhead (Ameiurus nebulosus Lesueur 1819) in Motuoapa Bay, southern Lake Taupo, New Zealand. Hydrobiologia 483: 129-135. Summary: Outlines the distribution of brown bullhead in Lake Taupo. Mentions that they may threaten the trout fishery there. Barnes, G. E., Hicks, B. J. 2003. Brown bullhead catfish (Ameiurus nebulosus) in Lake Taupo. In Managing invasive freshwater fish in New Zealand. Proceedings of a workshop hosted by Department of Conservation, 10-12 May 2001, Hamilton. 2003. Summary: Has information on the distribution, abundance and diet of brown bullhead in lake Taupo, New Zealand. McDowall, R. M. 1990. New Zealand Freshwater Fishes: a natural history and guide. Auckland. Heinemann Reed. Summary: An excellent reference book on New Zealand freshwater fish. Contains more in-depth information on species than McDowall, 2000. McDowall, R. M. 2000. The Reed field guide to New Zealand freshwater fishes. Auckland, Reed. Summary: Contains short descriptions and distributions far all freshwater fish found in New Zealand. An excellent reference.